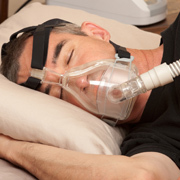 Sleep apnea machines are the most common way to treat sleep apnea. They use positive airway pressure to keep your airways open as you sleep. PAP machines, or positive airway pressure machines, are small in design and push air through a small tube into a mask that is worn over your nose or mouth. Our Pasadena sleep apnea machine expert can help you decide if a sleep apnea machine is right for you. You may have sleep apnea if you snore loudly, if you frequently wake up with a headache or sore throat or if you suffer from daytime sleepiness and fatigue even after getting a full night’s sleep. Our expert in sleep apnea machine in Pasadena may recommend a physical exam to identify possible issues that may be interfering with your breathing as you sleep. A sleep study may also be needed to accurately diagnose sleep apnea and determine the extent or severity of the problem. Sleep apnea machines can be used for both obstructive sleep apnea and central sleep apnea, which occurs when your brain fails to signal your breathing muscles. If you are a candidate for PAP therapy, you may need to use it in a sleep laboratory first so that necessary adjustments can be made. Several types of PAP machines are available and can include features that allow you to see how many apnea episodes you are having or how frequently you use your machine. Following all recommendations and your treatment plan can ensure the best possible results. A proper fit is also critical, and you may need to adjust the mask for better results. While sleep apnea machines are often the best way to reduce apnea episodes, they may not be right for every patient. Our Pasadena sleep apnea machine expert can help you explore alternatives that will work for you. Regardless of the treatment you choose, regular follow-up visits can help keep your apnea under control. Contact us today to learn more about available sleep apnea treatments or to schedule an appointment with our expert in sleep apnea machine in Pasadena.